Medieval history meets interactive storytelling. In 1362, violent storms pounded Europe, wiping out some coastal settlements. 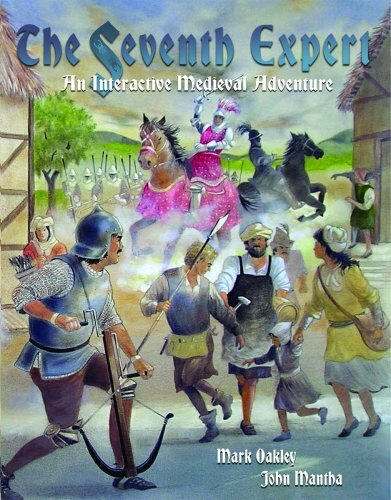 The Seventh Expert, which provides a compelling mix of history, storytelling and interactive fun, puts the reader in charge of rebuilding one medieval village. Through seven action-filled chapters, each representing a year of rebuilding, the reader faces the struggles of the emerging community. Luckily, six village experts are at the reader's service to offer advice along with a wide range of medieval tools and implements. These experts include: Blacksmith: tools (hammers, plows) and weapons (swords, arrows) Carpenter: buildings (houses, mills) and vehicles (carts, wagons) Farmer: food (bread, beer) and medicines (herbs, soap) Hunter: hunting equipment (bows, traps) and fishing gear (hooks, nets) Knight: siege weapons (cannon, catapults) and defenses (watch towers, palisades) Leatherworker: clothing (boots, leather armor) and riding gear (harnesses, saddles). The reader becomesthe "seventh expert," responsible for deciding which resources best suit each year's challenges. From finding food to fending off warlords, success depends on making the wisest choices. In all, 60 tools and implements are available in a back-ofthe-book catalog, with descriptions of their real-life properties and historical value to communities in the middle ages. Bursting with dramatic illustrations, memorable characters, and dozens of sidebars filled with facts about medieval life, The Seventh Expert is a history lesson like no other.